Trying to get your dog used to having his nails trimmed can definitely be a stressful situation — especially if you wait until your dog is past the puppy stage to try it for the first time. 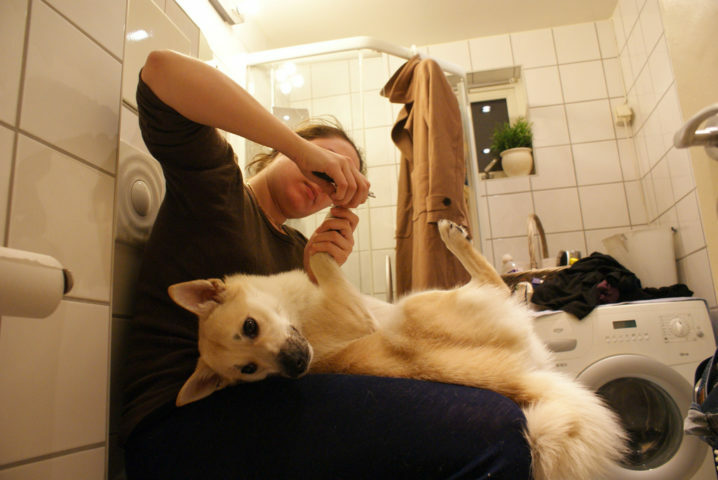 Your ability to be consistent when teaching your dog how to behave while having his nails done. Your underlying determination for trimming your dog’s nails yourself, rather than taking him to a groomer to have his nails done. With a little time and a lot of patience you will be able to trim your dog’s nails with little to no fuss. You can’t go into this thinking you’re just going to trim your dog’s nails quickly and correctly the very first time. No way. You can’t and you won’t. It’s a learning process — for both you and your dog. That mindset alone will go a long way. Have lots of treats handy for rewards. Start slow by just showing your dog the nail trimmer — and then give him a treat. Do this several times in a row to get your dog used to seeing the nail trimmer. Then put the nail trimmer next to your dog’s paw — and give a treat. Do this several times in a row to get your dog used to having the nail trimmer close to his nails. Next, practice grabbing your dog’s paws and squeezing their toes — give a treat each time. Do this several times in a row to get your dog used to what it’s like having their paws handled. Then, since it’s easier to trim a dog’s nails when the dog is lying on its side, practice getting your dog to roll over on his side — give a treat each time. Do this several times in a row. You want to do each of these things several times in a row and over several days before you actually clip the first nail. That’s how you get your dog to relax while having his nails trimmed. If you’re wondering about the steps involved with trimming a dog’s nails, here’s everything you need to know to trim a dog’s nails. Personally, I think the most important thing to remember is to keep it fun for your dog. Otherwise, your dog will stress out… and so will you. That might mean only doing one nail at a time — because that’s all your dog can sit still for at the moment. One nail at a time, a couple times a day, might take you a full week to do all of his nails for the first time — but that’s okay! It’s not about how quickly you can trim your dog’s nails, it’s simply about getting those nails trimmed. As you can see, all that’s required is a good dog nail trimmer (I use this one), lots of dog treats, a little bit of time, and a whole lot of patience. Remember, you’re also teaching your dog how to sit still and have patience with you and how to get comfortable with the process of having his nails trimmed. The more often you do it, the quicker your dog will accept having his nails trimmed regularly — and it will no longer be a stressful situation, but rather some good quality time that the two of you can enjoy together. My Dog Snores Through Nail Trims Now! I’ve been through this exact same nail training routine with 3 dogs that I’ve raised from puppies over the past 20 years. In addition to keeping it fun for your dog, I think the next biggest thing is to start early — preferably a few days after you first bring him home. Of course, most people don’t think about trimming their dog’s nails during those first few days & weeks — so I know it’s not realistic, but it is helpful if you could fit it in. The younger your dog is when he starts having his nails done, the more quickly he will adapt to the process — trust me. With my third dog (now 5 years old), the process is incredibly simple. He will lay on his dog bed — on command — and roll over so I can reach all 4 paws easily. He pretty much lays there (snoring!) until he notices that I’ve stopped touching his toes. That’s when he gets all excited because he knows he gets a “fun treat” for being so good while having his nails done. Now that kind of calmness didn’t happen overnight, but I can tell you it was definitely worth starting early with him — and I was always consistent with what I expected from him. I started by getting my dog familiar with the nail trimmer and the many ways that I would need to hold and squeeze each paw and each nail. I gave a treat every time he played along and did what I asked him to do. I trimmed only one nail at a time (one day at a time) until we eventually became comfortable with doing many nails in the same sitting. I ended with giving my dog one of his all-time favorite treats for making it through each nail training session — no matter how long or short it was, and no matter how good not-so-good he was. You end the nail training session (without giving a treat). There’s no yelling, or reprimanding, or obvious frustration on your part — because it doesn’t make any difference. Your dog has already checked out. Get ready to start the nail training session again whenever your dog is already in a calm state. Over time, he will get better each time and last longer each time.